Occasionally I utilize my blog to commend a really great book. Other times, I point out why a book, or more to the point, why a particular argument made in a book should be avoided. This is the case with Christian Smith’s book The Bible Made Impossible. Christian Smith is a sociologist at Notre Dame and genuinely wants to commend the Christian faith to the next generation. However, Smith seems to profoundly misunderstand what Christians mean when we say, “we believe the Bible.” Smith takes on a kind of popularized version of Biblicism and makes innumerable quotes from the internet and television programs showing how many Christian leaders say sloppy, sloganistic things about the Bible such as “Vote Responsibly – Vote the Bible” without careful reflection. Smith expresses considerable concern about these expressions of popular evangelicalism that see the Bible as an “answer book” or “instruction manual” ignoring the deeper message and intent of the Bible as a whole. Smith then moves from an indictment of popular light-weight evangelical statements about the Bible to his central thesis. He argues that the “Bible is impossible” because of what he calls pervasive interpretive pluralism. What he means by this phrase is that the Bible cannot be declared wholly true since it is filled with so many mutually contradictory statements. Smith’s argument is that the Bible contains numerous contradictory and/or conflicting statements. Since both of these statements cannot be true, the Bible cannot be a “clear, consistent, and focused instruction, direction, information and guidance for users” (p. 17). The fact that the “Bible believing” church cannot agree on such matters as the length of the millennium, whether a rapture will occur or not, what actually took place at the Lord’s Supper or the cross, or the role of women in ministry is, for Smith, a great disaster which the church has, for 2000 years, simply been unwilling to come clean about. 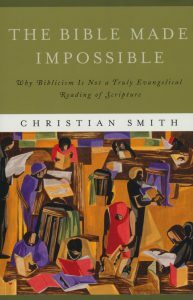 Smith concludes and states in emphatic italics the following statement: “On important matters the bible apparently is not clear, consistent, and univocal enough to enable the best-intentioned, most highly skilled, believing readers to come to agreement as to what it teaches” (p. 25). I would not deny that Smith does make many valuable observations about how we can and should read Scripture better. He certainly does expose the sloppiness of televangelists and popular authors who make statements which do not best capture the purpose and intent of the Biblical text. However, I would say that 90% of what he suggests as the “better way ahead” has long been endorsed by serious evangelical thinkers who affirm that the Bible is God-breathed. However, I remain troubled that Smith’s thesis is built around his indictment of the “pervasive interpretive pluralism” of the Bible. It is clear to me that Smith misses several crucial points which are necessary for a proper understanding of Scripture. First, he fails to see the perspicuity of Scripture. Smith falls into the trap of being overly concerned, for example, that Methodists and Baptists cannot agree at every point on certain aspects about baptism, but misses the fact that Methodists and Baptists (along with Presbyterians and Pentecostals and a thousand other groups I might name) share a common faith which is, in fact, clear and univocal. Where is the great semper ubique ab omnibus (always, everywhere by everyone) of the church in Smith’s book? How can he miss that great global resonance of Nicea which unites the faith of the entire church? How can a dispute about tongue speaking be used to undermine the Apostles’ Creed? Second, Smith misunderstands the very nature of truth and how it is apprehended by the church (both around the world, i.e. globally and back through time, i.e. historically). I am not sure if Smith’s problem here is fundamentally epistemological or theological. I think it is the latter, but those who know Smith better might help me here. Smith fails to see that many of the great truths of Scripture are so vast and so difficult for the human mind to comprehend that no one statement can fully capture it. Statements which, in isolation, appear contradictory are, in fact, pointing out different facets of a deep truth which transcends the very kinds of simplistic solutions which Smith claims he wants to avoid. His so-called “interpretive pluralism” is, in my mind, more about our inability to fully grasp the meta-narrative of Scripture than an internal and embarrassing problem with the text of Scripture. The fact that Wesleyans and Presbyterians disagree about pre-destination is not the basis for an indictment against the clarity of Scripture, but, more likely, a necessary tension which makes both Wesleyans and Presbyterians better Christians in the long run. Classic tensions such as Law and gospel, election and free will, truth and grace, judgement and mercy, and so forth, are not embarrassing signs of biblical confusion and an incoherent message. These are beautiful, multi-faceted diamonds of God’s self-revelation. They are glorious emblems of the vastness and depth of God’s nature and his own unfolding plan which will only be seen in its fullest clarity at the dawn of the New Creation. There is an old African proverb which says, “the mother feeds the baby when it has no teeth so that the baby will someday feed the mother when she has no teeth.” The truth of that proverb came home to me powerfully this week when my 84 year old mother fell and broke her hip. To get the full impact of this you have to know something of my mother. She is the most active 84 year old I have ever known. For example, about a year ago I went down to Atlanta to visit her. I couldn’t find her anywhere in the house. A quick check of the garage revealed the car still in its spot, so she had to be somewhere at home. I finally found her at the back of the house on top of a ladder cleaning leaves out of the gutter. I told her she might be a bit old to be carrying ladders around and cleaning gutters. She looked at me with incredulity that I would even raise the question. She still holds the record for the oldest person to ever ride down Arvid Metcalf’s famous “zip line” here in Wilmore. She did that the week of my inauguration in 2009. Her house is famous in the circle of her friends for being a “better homes and gardens” type house. If you don’t know what that means, you’re probably under thirty years old. It means that her lawn is always immaculate with beautiful flowers and well trimmed bushes. Her house is so well appointed we could almost open up tours to show it to the public. It is such a picture of beauty. Whether it is the porcelain figurines on the mantle, beautifully filigreed frames on the wall or dainty lace carefully placed beneath every lamp, she has mastered the art of home presentation. All this happens because of my mother’s hard, daily work and commitment to excellence. Whenever I come to Atlanta she always gives me a list of chores to do (just like old times). Now that I am President of Asbury, my schedule has kept me from always attending to this list as quickly as I once did. One of the items was a large tree in the backyard which needed to be taken down. Before I could arrange to come down I learned that she had taken the tree down herself. In amazement I asked how she did it (she doesn’t own a chain saw – at least not yet). She had taken a hand saw and sawed ten to twenty strokes each day for two months, finally bringing the tree down. This is a small snapshot of my mother. The idea that she is “old” has not yet crossed her mind. She knows how to make things happen and makes sure it happens with beauty, grace and excellence. So, here I was this week, along with my two brothers taking care of my mother. I helped her to eat (remember the African proverb) and watched as she lay there unable to move. Within 24 hours of the operation she took her first step and now, several days later, she is walking with the aid of a walker. She is headed for two weeks of intensive physical and occupational therapy so, to use her phrase, “I can get back home where I belong.” The physical therapy people have been amazed at her strength – both physically and her inner drive – to get back to her former capacities. 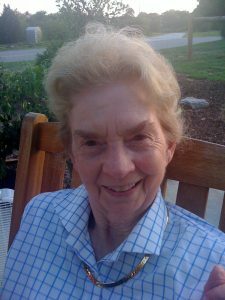 For my mother, her physical challenges are also causing her to trust in the Lord in ever deepening ways. Her faith in Christ has always been central to her identity. Indeed, everything she does she sees as an expression of her faith in Christ. There are two kinds of age. There is outer age and there is inner age. The Apostle Paul says in 2 Cor. 4:16 that although our outward bodies are wasting away, our inner life is being renewed day by day. My mother may be getting old on the outside, but her inner life is vibrant and determined. I am now 52 years old, but my mother is still teaching me how to live in every season of life. She is teaching me how to live with determination and vigor. She is teaching me the meaning of the phrase, “never give up” and the beauty of spiritual growth in every season of life. The doctor came in on Friday and gave her the good news that she was ready for rehab, but that “her ladder climbing days were over.” She gave him a little scowl. I don’t think she should ever get on a ladder again, or travel down zip lines. But I admire her capacity to embrace life, and she knows that whether in this life or in the one to come, there will be ladders to climb, work to be done, and glory to be revealed. Auld Lang Syne and 2012: The Year of the Prophet? In what has got to be one of the cruelest twists of history, Robert Burns (The great bard of Scotland) was the author of some of the most powerful and thoughtful poetry ever written by a common pen (To a Mouse; A Man’s a Man for a’ That; Scots Wha Hae, etc…). Yet, the one poem he is most known for is his very forgettable song, Auld Lang Syne which is often sung at the turn of the New Year by highly inebriated people. It is likely Burns actually took an old poem by the same name and merely re-worked it a bit, since it lacks his usual poetical power. The phrase “Auld Lang Syne” is a Scots phrase meaning, “old long since.” I recall this phrase because it does call us to remember – and that is the theme of this blog entry. Indeed, this is my deepest prayer for the church of Jesus Christ in 2012. Walter Bruggemann, the Old Testament scholar, observes that the main function of a prophet is to awaken the spiritual memories of the people of God. The church in the West is plagued by spiritual amnesia which has cast us into a perpetual state of forgetfulness. I sat in a Christmas Eve service this year in a United Methodist church in Maryland where the pastor had clearly forgotten the Gospel (no difference between believing in Jesus Christ and believing in Santa Claus, the pastor cheerfully declared, because it is not about ‘facts’ and ‘history’ but about child-like faith and believing!). Perhaps you’ve had a few experiences like this as well. I sometimes leave church filled with joy and the memory of God’s mighty deeds. Sometimes I leave church angry and upset. Why the difference? It has nothing to do with the style of the service (contemporary or traditional, modern or liturgical). It comes down to the capacity of the pastor and leadership to invoke the memory of God’s mighty acts and apply that to our lives today. Today, at almost every turn we meet Christians who have forgotten. We forget the apostolic message, we forget our beginnings in God and we forget our final destiny in the New Creation. The value of recollection – of remembering the “old long since” – is crucial to the life of the church. It is surely one of the great challenges for men and women preparing for full time ministry. How do you awaken the spiritual memories of the people of God? It is the church which must remember God’s mighty deeds (See Psalm 77 for a great example of this). I think Bruggemann is pointing out to us that this kind of renewal cannot happen without the re-kindling of the prophetic gifts. The pastoral calling will always be central to the life of ministry. But we desperately need a generation of prophets. We need men and women bold enough to remember and to call the church to remember. In so doing, they will touch on the moral nerve of the Old Faith. We need that prophetic capacity which is the dogged refusal to forget. A little more prophetic courage is not only good for the church – but it helps the world to see that we really are different. We are not mere peddlers of religious commodities, we are bearers of God’s word and mediators of his divine presence. I don’t know about you, but I’m praying that 2012 be the year of the prophet.